A fresh, healthy, and easy to make twist on a traditional tabouleh. A special thanks to Gail from Active Ageing in Australia for this recipe. Blitz broccoli (including stem) in food processor. Peel, remove seeds and dice cucumbers. Finely dice red onion. Remove seeds from tomatoes and dice flesh. Chop mint and parsley finely. Combine all ingredients in a large bowel, adding more seasoning to personal taste. Can also add crushed garlic or diced chilli if you wish (highly recommended). Serves 4 in your loveliest bowl. 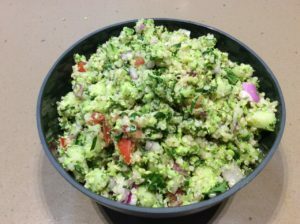 Add protein and chopped salad with the Tabouleh for a complete meal. Tahini Dressing from MNMC recipes also goes lovely as a side dish.